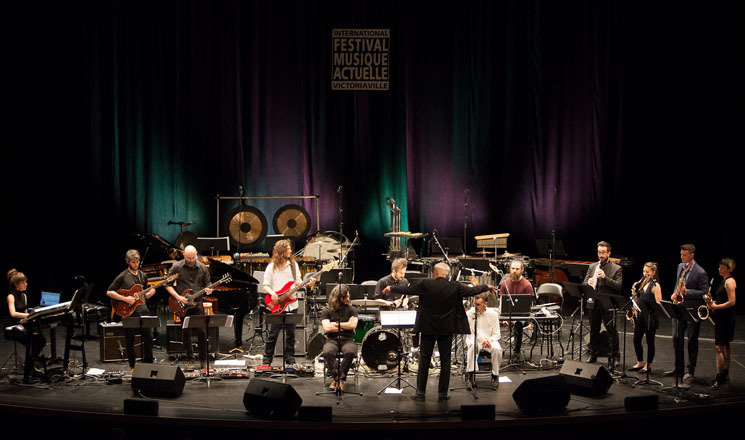 What could be more fitting to kick off FIMAV's 34th edition than celebrating a composer/conductor with a performance of two of his pieces that span 40 years of contemporary music in Québec? Walter Boudreau has been artistic director of the Ensemble de la Société de musique contemporaine du Québec (SMCQ) since 1988, but the first composition performed, "Paix," dates back to 1971, a stormy era for the province. Played by the 12-member group 333 ToutArtBel under the direction of Phillippe Hode-Keyser, "Paix" is turbulent and exploratory, combining a freewheeling sense of discovery with a very groovy '70s rock centre enlivened with a very present and electric energy by the young musicians. Like witnessing a moment in time that is being released and refined. The second half featured Walter Boudreau himself, very spry and limber at 70, directing 15 members of the current SMCQ to perform his 2013 piece "Solaris (Incantations VIII-IXh)." Many of the composition's 23 movements begin with or contain an explosive moment that brings to mind the Bernard Herrmann film scores of the 1950s and '60s, where moments of revelation or peril are highlighted with sharp shocks of strings, brass and percussion. On the latter, percussionists Philip Hornsey and Julien Grégoire were the athletic stars of the evening, sprinting across the backstage to play about a 55-foot expanse of marimbas, gongs, tympani and large-framed bells. Balanced against the rock looseness of the first half, this performance had the exacting feel of growth and experience, but with the same hopefulness and forward gaze.